Frank Short was born in Stourbridge, Worcestershire. He trained as an engineer but abandoned this career for art. He studied at South Kensington (later the Royal College of Art) and Westminster Schools of Art, London. He won gold medals at the Paris Salon for engraving and from 1891 until his retirement in 1924 he taught engraving at the Royal College of Art. The discipline he required from his students was largely responsible for the excellence of British etchings in the inter-war period. From 1910 to 1939 he was President of the Royal Society of Painter-Etchers, and in this capacity he was awarded a knighthood. 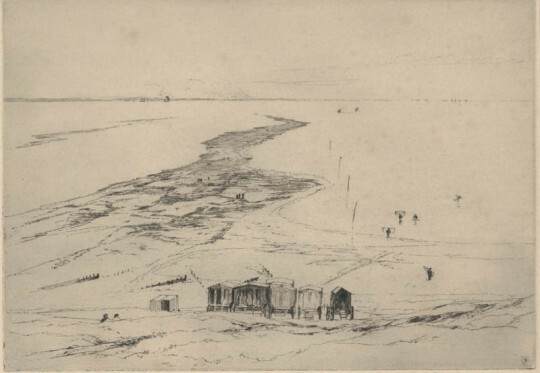 In all he produced some 209 etchings and drypoints and his subject matter included seascapes and foreshores from around Bosham and Rye in Sussex, the Mersey in the North West of England, Polperro and Seaford in Cornwall, as well as views in Holland. He worked directly from nature onto the plate which as the artist Martin Hardie observed makes demands upon the nerves and which gives the line a tremorous quality. His atmospheric nocturnes show something of his admiration of the work of James McNeil Whistler.